Details 1937 Foster and Reynolds Map or Plan of Washington D.C. 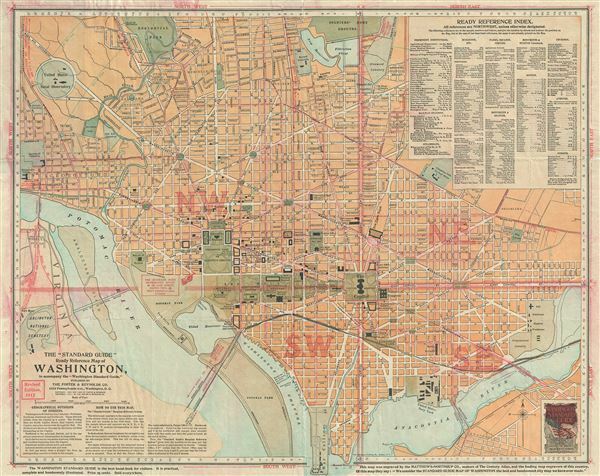 This is an appealing 1912 map of Washington D.C. by the Foster and Reynolds Company. This map covers Washington D.C. from the Arlington National Cemetery eastward as far as the Anacostia River and from the Soldiers' Home Grounds to the War College (southern tip of Washington DC). The map is exceptionally detailed noting important buildings, monuments, streets, parks, railroads, and other topographical features throughout. They city is divided into four sections by red rays emanating from the Capitol Building. A 'Ready Reference Index' is set in the upper right quadrant. A short paragraph in the lower left quadrant details the geographical divisions of streets and includes a note on how to use this map. This map was first copyrighted in 1901 and went through numerous subsequent editions. This map was engraved by Matthews-Northrup Co. and published by the Foster & Reynolds Company, Washington D.C. Very good. Minor wear and verso repair along original fold lines. Repair in upper left quadrant. Blank on verso. Folds into original cardboard binder.